Jan Ormerod, who passed away earlier this year, was a much loved picture book illustrator and author. Born in Western Australia in 1946, Jan later settled in the UK, where her first picture book ‘Sunshine’ won the Mother Goose Award in 1982, the first of a remarkable series of books for children. Gillian McClure, who knew her well, here offers a personal memory. I first knew Jan when her girls, Laura and Sophie were little and she lived in Cambridge in a terraced house, like mine by the river Cam. My youngest son and Laura went to the same school and I was often popping over to Jan’s house to enjoy a cup of tea and a chat beside her Aga. It was all very homely there with two pet rabbits hopping around the garden. Jan (on the right) in 2008 with Jana Novotna-Hunter and Amanda Hall at the Bologna Book Fair. Later Jan went to live in Rutland and we did not see so much of each other except at the Bologna Book Fair where we often shared self catering accommodation with a group of UK illustrators. 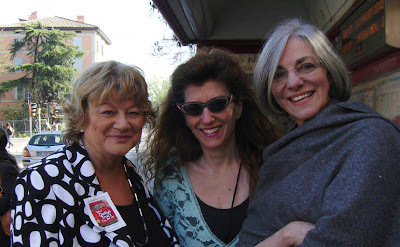 Jan attended the Fair to see her Australian publishers, Little Hare, but there was also a lot of time to enjoy the parties the different publishers threw and to sit in the Piazza Maggiore enjoying the wine and sunshine. Once we went to an exhibition of artwork by Lisbeth Zwerger and I remember Jan being very taken with the way Zwerger drew people and children. Jan herself will always be remembered for the way she drew children. 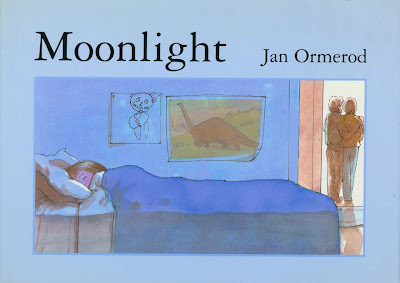 In Moonlight, the companion book to her first, award winning, picture book, Sunshine, she is able to show the tenderness between a father and daughter and capture all the stances and mannerisms of small children.